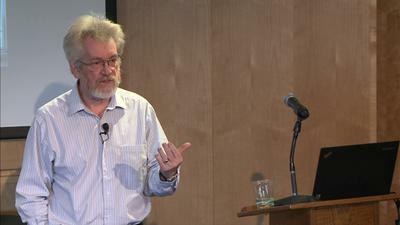 For the last decade, Sandy Pentland's research has investigated what can be learned from continuous monitoring of human behavior. What has emerged is a very different picture of healthy and unhealthy human life, one that acknowledges the primacy of social relationships over internal state, and is more rooted in ethology, field biology and evolution than than in medicine or cell biology. This view of the human condition has allowed us to not only monitor human wellbeing from currently available information sources, but to predict impending problems and to re-establish healthy behavior patterns. Professor Alex "Sandy" Pentland helped to create and direct the Media Lab, where he directs the Human Dynamics research group and leads the Connection Science initiative. One of the most-cited scientists in the world, Forbes recently declared him one of the "7 most powerful data scientists in the world" along with Google founders and the Chief Technical Officer of the United States. He is a founding member of advisory boards for Google, AT&T, Nissan, and the UN Secretary General, and a serial entrepreneur who has co-founded more than a dozen companies including social enterprises such as the Data Transparency Lab, the Harvard-ODI-MIT DataPop Alliance, and the Institute for Data-Driven Design. Pentland and his students pioneered computational social science, organizational engineering, wearable computing (Google Glass), image understanding, and modern biometrics. His most recent books are Social Physics (Penguin Press, 2014) and Honest Signals (MIT Press, 2008). He received his BS in computer science from the University of Michigan, and his PhD in computer science, psychology, and AI from MIT. Pentland is a member of the US National Academy of Engineering, a leader within the World Economic Forum, and has received numerous awards and prizes including the McKinsey Award from Harvard Business Review, the 40th Anniversary of the Internet from DARPA, and the Brandeis Award for work in privacy.